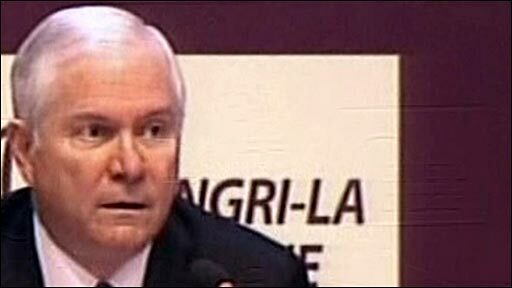 US Defence Secretary Robert Gates has accused Burma of causing the loss of tens of thousands of lives by hindering international cyclone relief efforts. 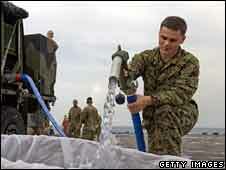 Mr Gates said the United States had had ships and aircraft ready to help after Cyclone Nargis hit a month ago. Unlike Indonesia and Bangladesh after major natural disasters, Burma had denied entry to the country, he said. An estimated 2.4m people remain homeless and hungry following the cyclone, which struck on 2 May. "Many other countries besides the United States also have felt hindered in their efforts," said Mr Gates, speaking at a security conference in Singapore. "Despite these obstructions, we continue to get help into Burma, and remain poised to provide more," he added. On Friday a senior UN official said any coercion of Burmese cyclone victims to return home was "completely unacceptable". Terje Skavdal's remarks follow reports that Burma's military government had begun to evict homeless families from some government-run emergency camps. It has given them bamboo poles and tarpaulins and told them to go and rebuild their lives, say reports. Mr Skavdal, head of the UN Office for the Co-ordination of Humanitarian Affairs, said he could not confirm the camp closures but pointed out that the agency did not endorse premature return to areas with no services. "People need to be assisted in the settlements and satisfactory conditions need to be created before they can return to their place of origins," said Mr Skavdal. "Any forced or coerced movement of people is completely unacceptable." A Unicef official, Teh Tai Ring, had earlier said camps set up by the government in the Irrawaddy Delta towns of Bogale and Labutta had been emptied, according to the Associated Press news agency. Mr Skavdal also complained of "bureaucratic hindrance" of aid workers and urged the junta to allow in 30 International Red Cross staff who were awaiting visas. Last week, senior General Than Shwe assured UN Secretary General Ban Ki-moon all foreign aid workers would be allowed in. The international community last week pledged $150m (£75m) for cyclone relief in Burma but state media lashed out at donors, saying the junta needed $11bn to rebuild the stricken country. The Burmese-language daily, Myanma Ahlin, said cyclone survivors could get by without "bars of chocolate" from the international community. At least 78,000 people have died as a result of the cyclone, and another 56,000 people are still missing.